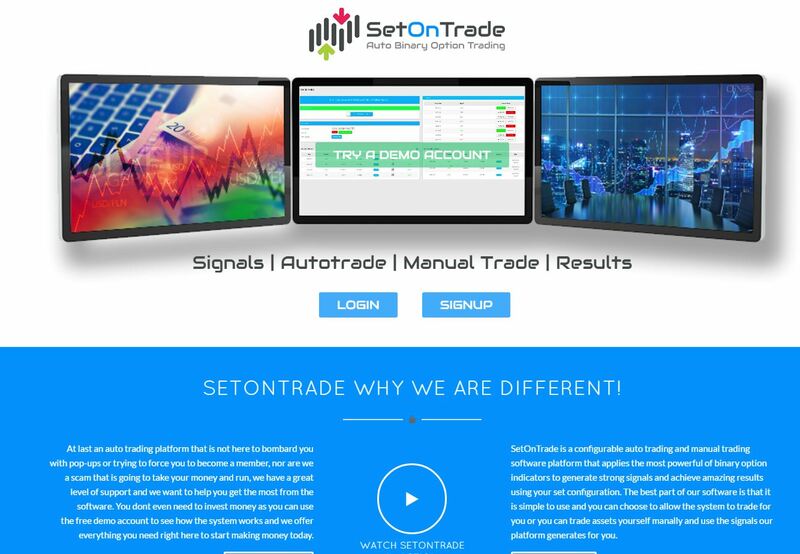 In this review we prove that SetOnTrade is a scam that abuses binary options. You should not use this robot. 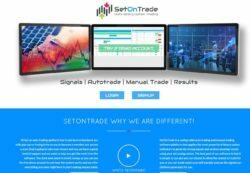 On the SetOnTrade website you can read that it is an auto trading and manual trading software platform that generates strong signals and achieves amazing results. You allegedly can expect an 80% win rate, which would mean great profits. And as usual, making money is free nowadays, so the SetOnTrade robot is of course free. On the SetOnTrade website you can read an explanation why this robot is supposedly so different from the others. But in reality it is not different at all, it is based on the White Label Robot that is widely used by scammers. Look at the picture and you’ll see a few examples of other scams using this same robot, like Option Robot, Gold Binary Robot and iRobot. The most disgusting and dangerous aspect of this software is that it provides a demo that fakes results. We have proven that several times in the past, you can read our reviews. It basically fakes the results so that the performance of the robot looks great. 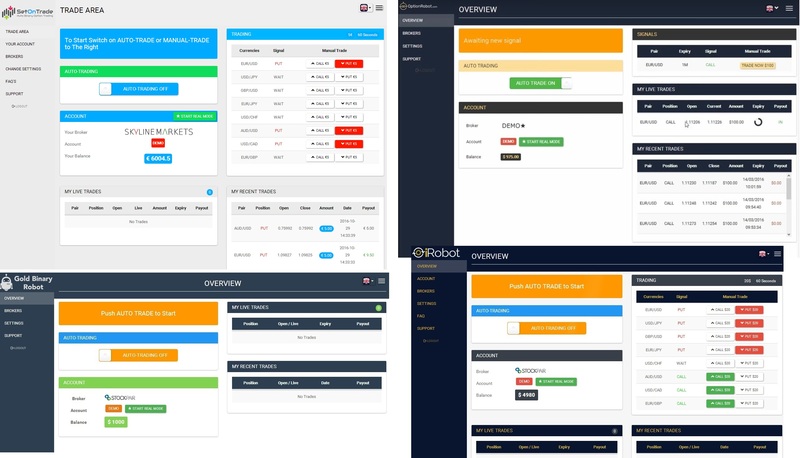 You can see proofs in our reviews and also on the picture on the right, the SetOnTrade robot opened two trades on currency pairs. But look at the date, it is a Saturday and on Saturdays markets are closed, so you cannot trade Forex binary options! By faking demo results this software can fool a lot of people. It can make them believe that the robot is really profitable, so they will open a real account and let it trade with their money. But as real trades cannot be faked, the robot is losing in trading with real money, so it loses money to real users. Now you might ask why do scammers give away for free a losing binary options robot? Because they are affiliated with some binary options brokers that pay them for referring new depositors. This is why they try to fool you with their fake demo, they need you to deposit with their broker. If you do it and let Set On Trade trade with your deposit, you can be sure that the robot will lose your money. But by then scammers will already have their commission thanks to you, so they don’t care. SetOnTrade is a very dangerous scam, because it fakes demo results to make you believe that it is profitable, but it is not. You can see on a real free demo account with a regulated broker how binary options trading really work and what you need to learn in order to really make money. And forget about free money making robots on binary options, they don’t exist! OMG this one as well… I use this one the same and it is working have you even traded with this at all? Don’t listen to him he’s a hypocrite himself begging for donations, and copy and pastes his answers from one review to another here’s the proof compare this to the answer below. The guy’s a fraud end of why else would he be so aggressive when someone disagrees with him. John Novak just grow up you childish spoilt little brat of a nobody trying to make a name for yourself you are just desperate for attention. John, trust me, you’re an idiot. You know that talking to yourself publicly is not right, don’t you?